In spring, one of the first weeds that will break through the residual herbicide coverage provided by preemergence applications is horseweed, aka marestail. Horseweed has two primary periods of emergence, from late March through June and from late summer through late fall. Some of the most problematic horseweed emerges in the fall and over winters as small rosettes. If growers don’t control it with fall-applied residual herbicides, the weed has an excellent head start on the spring growing season, especially after a mild winter. 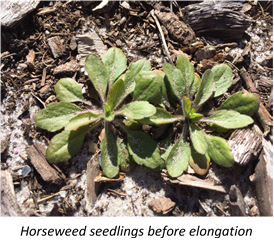 Horseweed plants remain in the rosette stage through mid-April, followed by stem elongation (bolting) and rapid growth to an height of 3 to 6 feet. Plants that emerge the previous fall will bolt earlier than spring-emerging plants. Horseweed is most easily controlled when in the seedling, or rosette stage, and spring postemergence herbicides should be applied before stem elongation. Treating them early is the key to success. Control of horseweed when its 2 to 4 inches is more likely than when it’s over 10 inches tall. Remember, most of the horseweed in New Jersey is resistant to glyphosate and there is a good probability that our populations are also resistant to ALS herbicides such as halosulfuron (active ingredient in Sandea) or rimsulfuron (active ingredient in Matrix). So, the most consistent options to control emerged horseweed include paraquat, clopyralid or glufosinate applied to small plants. Paraquat – Use 2.4 to 4.0 pints/A of Gramoxone SL 2.0. Gramoxone is a contact killer that has no translocation or residual activity. So, best results will be achieved when seedlings are less than 1 inch in diameter. Two applications, two weeks apart are more effective than a single application. Regrowth may occur from the root systems of established weeds. Always use a nonionic surfactant (0.25% v/v) to improve the weed leaf surface in contact with the herbicide and enhance weed control. Do not allow spray or drift to contact green bark, leaves, or fruit as crop damage may result as shown on the picture. As Gramoxone targets the plant photosystem apparatus, applications made at sunset will increase weed control efficiency by allowing more herbicide to penetrate before being activated by sunlight in the morning. DANGER: Do not breathe spray mist. Read safety precautions on the label. Clopyralid – Use Stinger at 3 to 4 fl oz/A of. 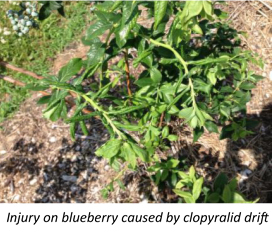 Stinger has a 24(c) Special Local Need label for weed control in blueberry since 2013. Stinger acts as both a postemergence foliar absorbed herbicide and a residual herbicide. The initial twisting and curling observed after application to susceptible species is due to the foliar absorption. Do not apply Stinger from one week prior to bloom until one week after bloom. Stinger can eventually be tank-mixed with Gramoxone to increase the spectrum of weeds controlled and defoliate existing foliage of perennial asters, goldenrod species and mugwort. Donot allow spray or drift to contact green bark, leaves, or fruit as crop damage may result as shown on the picture. Time all applications to maintain a 30-day PHI (PreHarvest Interval). Do NOT apply Stinger in a hand-held sprayer used to “spray until wet”. Stinger is a residual herbicide that must be applied on a rate per acre basis with a precisely calibrated sprayer. Read safety precautions on the label. Glufosinate – Use Rely 280 at 48 to 56 fl oz/A. Rely is a foliar active, nonselective herbicide that controls a broad spectrum of emerged annual and perennial weeds. Best results are obtained when it is applied to actively growing weeds. Glufosinate does not provide residual weed control but can be tank mixed with residual herbicides for broad spectrum control. 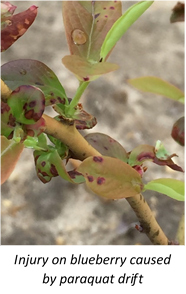 Contact of Rely with parts other than mature callused brown bark will result in extremely severe damages to the blueberry bush. Do not apply within 14 days of harvest. Warm temperature, high humidity, and bright sunlight will improve the performance of Rely. Read safety precautions on the label.